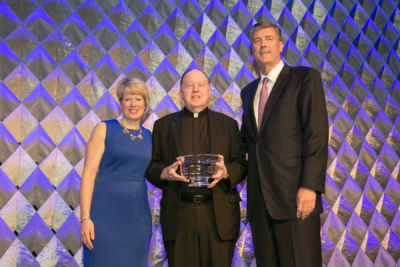 Boston, MA – April 26, 2015 – Big Brothers Big Sisters of Massachusetts Bay, one of the nation’s leading one-to-one mentoring programs, today announced that its annual Big of the Year gala will honor Boston College President William P. Leahy, SJ, on Thursday, May 5, 2016 at the Boston Marriot Copley Place. The organization recognizes the College’s ‘BC Bigs Program’ as its first campus-based mentor program, which started in 2010. Fr. Leahy will receive the 2016 John B. Pearson “Excellence in Mentoring” award for his significant, positive and immeasurable impact in the lives of children in the local community at the 2016 Big of the Year gala. Throughout his nearly 20 years as president, Fr. Leahy has been committed to providing opportunities for the growth and development of all students, within the Boston College community and beyond. The gala will include remarks from Fr. Leahy, Boston College senior Andrew Marchesani, who has been matched with his “Little” since his freshman year in 2012, and Wendy Foster, CEO of Big Brothers Big Sisters of Massachusetts Bay. The evening’s emcee, Billy Costa of NESN’s Dining Playbook and KISS 108, is also the auctioneer for the silent and live auction taking place before dinner. Boston College created the BC BIGS program in 2010, and continued to grow its partnership with Big Brothers Big Sisters of Massachusetts Bay and Big Sister Association of Greater Boston since that time. There are currently 265 Boston College men and women serving as Big Brother and Big Sister mentors. Student mentors meet with their Littles on campus, in Littles’ schools, during afterschool programs and throughout the Boston community. Since its inception, the BC Bigs program has enabled hundreds of children to not only experience the benefits of Big Brothers Big Sisters mentoring, but also to visit a college campus for the first time. Through their connections with Boston College mentors, these children, many of whom live in areas that are difficult for Big Brothers Big Sisters Massachusetts Bay to reach through traditional community-based programming, are now pursuing their own plans for college – a concept they never previously considered. Boston College leaves its largest footprint on male matches – a constant need emphasized by Big Brothers Big Sisters of Massachusetts Bay. Since the first official match in October 2010, BC Male Bigs have spent more than 10,000 hours mentoring in its program, 82 percent of those mentoring relationships lasting until a Big has graduated or beyond. Currently, the BC Bigs Program has 127 males placed in more than nine different sites, including Franklin Field. Following the successful campus-based program model developed with Boston College, Big Brothers Big Sisters of Massachusetts Bay has expanded this model through partnerships with Babson College, Massachusetts Maritime Academy and its recently unveiled partnership with Endicott College. The Big of the Year annual gala celebrates the spirit of volunteerism and recognizes remarkable community leaders who help brighten the lives of children. Since the first Big of the Year in 1993, Big Brothers Big Sisters of Massachusetts Bay has raised more than $9.5 million, helping support more than 3,500 one-on-one friendships between young people and adult mentors in the Massachusetts Bay area. For ticket and other event information, including the chairs and committee, please visitbbbsmb.staging.wpengine.com. Visit the Big Brothers Big Sisters of Massachusetts Bay website to find more information on how you can Add a Little to your life today. Boston College is a Jesuit, Catholic university located in Chestnut Hill that serves 9,100 undergraduate students and 5,000 graduate and professional students in its eight schools and colleges. Founded in 1863, BC is ranked among the top 30 national universities by US News & World Report. Big Brothers Big Sisters of Massachusetts Bay is an innovative, energetic organization that is making a real difference in the lives of over 2,100 youth by providing them with an invested, caring adult mentor. With research and proven outcomes at its core, Big Brothers Big Sisters of Massachusetts Bay is working to ensure every child has the support from caring adults that they need for healthy development and success in life. The organization’s vision is to inspire, engage and transform communities in Massachusetts Bay by helping youth achieve their full potential, contributing to healthier families, better schools, brighter futures and stronger communities. To learn more, visit bbbsmb.staging.wpengine.com.